Take I-25 North to Exit 210A for Colfax Avenue. Turn left on Court Place. The Colorado State Bank Building has a parking garage which can be entered from 16th Street. We will caution you, however, that there is no daily maximum in the basement parking garage. Metered parking is available along Broadway and Lincoln streets, and there are several hourly lots located nearby on Lincoln as well. Click here for a staff directory with direct extensions. STUDENTS & EDUCATORS, click HERE. 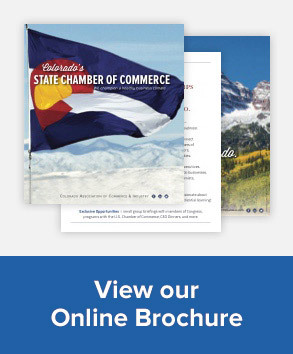 The Colorado Chamber does not have maps or other classroom project materials. For TOURISM or other Colorado Information please see links at the upper left of this page.